The stool/side table can be stacked to save space when not in use. You can put two TRANARÖ together to make a small coffee table. Comes pre-assembled, so you can start using it immediately. The plastic feet protect the floor against scratching. 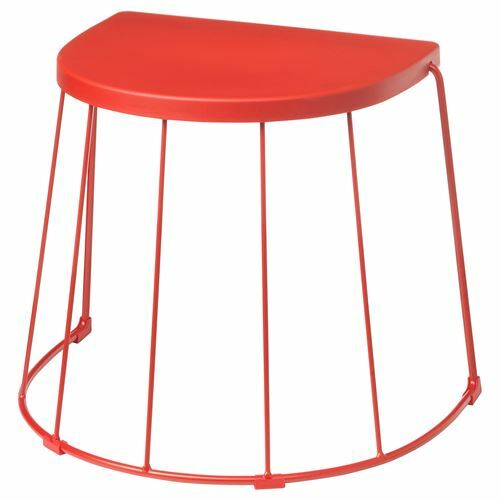 The stool/side table is durable and easy to care for, as it is made of powder-coated steel and plastic. This stool has been tested for home use and meets the requirements for durability and safety, set forth in the following standards: EN 12520, EN 1022 and EN 581. Storing: If possible, store your outdoor furniture in a cool, dry place indoors. If you need to store the furniture outdoors, tilt it and cover it with water repellent covers. Allow air to ventilate, to avoid moisture and mould.